Fabled to be the treasure of mermaids, Aquamarines have long been associated with the sea and the moon. In ancient times, sailors wore Aquamarines for protection during their voyages – a tradition that has carried over into modern centuries. This beautiful blue-green or transparent turquoise gem evokes a deep sense of calm tranquility and peaceful resolutions to conflicts. 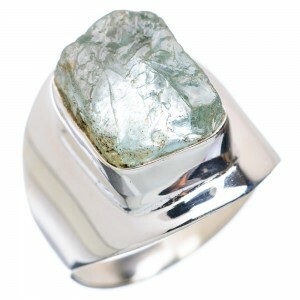 Aquamarine rings and pendants are perfect romantic gifts to symbolize love as eternal as the sea. Aquamarine is also the March birthstone. The masterful artisans of Ana Silver Co. have set genuine Aquamarines into pure 925 Sterling Silver jewelry – a true marriage made in heaven! Peruse our stunning collections of Aquamarine silver pendants, Aquamarine silver rings, and Aquamarine silver earrings for unique one-of-a-kind gifts!